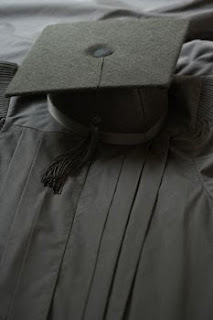 I truly enjoyed my college years, but I must admit my graduation itself (the ceremony, etc.) was really not very memorable. I remember sitting through a bunch of boring-ish speeches and waiting for my name to be called so I could walk across the stage to grab my diploma. It's kind of a shame that the culmination to my 4.5 years at the University of Wisconsin wasn't something more memorable. With that said, what do you expect, finals week was still going on and Christmas was just days away. I found a post today from the Swarthmore College Arboretum. The Arboretum takes part in a special graduation tradition. Prior to marching and receiving their well-earned diplomas, graduates can meet Arboretum staff to have a fresh cut rose from the Dean Bond Rose Garden pinned on their gown. In addition, after the ceremony, graduates are given an Itea virgincia ‘Henry’s Garnet’, Virginia sweetspire, as a living memento of their years spent among the gardens of the campus-arboretum. ‘Henry’s Garnet’ was named and introduced by the Scott staff in 1984. It has exceptional fall color lasting from October into December reflecting the Swarthmore College school color of garnet. Read more about this wonderful tradition on the Scott Arboretum's Website. What a unique and memorable tradition. Do you have any special graduation memories or traditions? Please let us know.